Waves are the source of many of the most beautiful and fascinating phenomena in physics, and a key idea underlying our deepest models of reality. The signature feature of waves is interference, and we frequently refer to interference effects to justify our claims about the wave nature of light (and electrons, and buckyballs, and…). This resource provides a new way to model waves that allows a more direct and intuition-building experience of interference. The interference of waves is a very abstract and difficult idea for many students and for some time I have attempted to find a simple hands-on model for waves that clearly showed this concept. One good attempt at this involves printing sine waves on transparency, but the result still requires quite a bit of interpretation. The density of a gradient allows for a much more intuitive wave overlap and spreadsheets provide a very easy way to construct such a printout. Here are examples showing constructive and destructive interference. 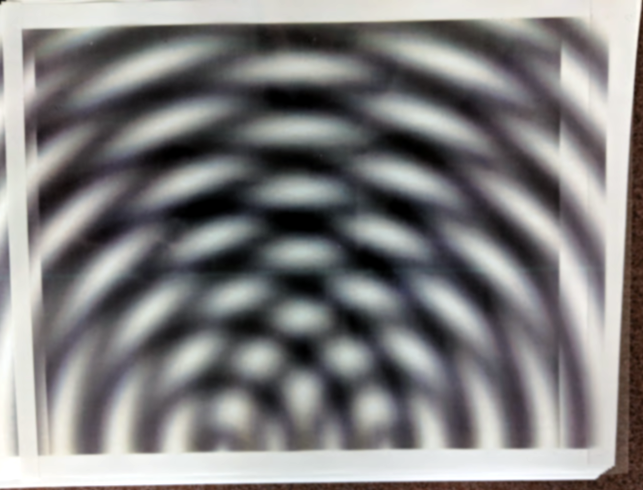 The transparency is printed with a density of grey to represent the amplitude, from clear (a trough) to about 40% dark (a peak). Overlapping two crests then produces a more intense region, while two troughs remain clear. A crest on a trough produces a uniform grey. Since the shading is done according to the amplitude, intermediate forms of interference are also modelled reasonably well. Students can quickly observe while playing with the waves that constructive interference happens when one wave is displaced a whole number of wavelengths, and destructive for ‘half way’ points. A few simple exercises show the criteria for constructive and destructive interference in this intuitive way. Accompanying this article is a zip file with the wave generator and three PDFs of waves for those who might not have Excel but want to try the model. The spreadsheet uses Excel conditional formatting to produce wave images of adjustable type, wavelength, phase, and origin. There are two sheets, one of which has the ‘controls’ to produce the waves you want (“Settings”), and the second sheet/tab is the one to print (“Image”). The image sheet must be printed at reduced size. It prints on 8.5” × 11” North American standard paper at 11% (which should be preset). At this scale 1 unit is about 2.8cm (1.1 in). The settings allow you to specify a wavelength (in the semi-arbitrary units of the image sheet) and a phase (in degrees). You may specify either circular waves (type 0, because that’s kind of circular?) and plane waves (type 1, because… you get it.) The options presented change to fit the type of wave chosen. If you choose circular waves you may specify the waves centre. If you choose plane waves you may choose waves moving in the x-direction (along the long side of the paper) or moving in the y-direction (along the short side). The sheet is defined in landscape orientation, with x-values ranging from -4.8 to +4.8 (zero centred) and y-values from 0 to 7.3 top to bottom (admittedly inconsistent, feel free to change it as you wish). The values correspond very roughly to inches on the printout, but only very approximately. I have made no attempt to be more precise as different printers will scale things slightly differently in any case! Print the waves directly to a laser or inkjet printer with suitable transparency. Try some prints on plain paper first to adjust the settings, and see if your printer has a transparency ‘paper’ setting! I print copies on transparency and an equal number on paper, since in many situations only one wave needs to be transparent and this saves a lot of expense! If longer wave strips are needed the strips can be glued to make longer strips, but you need to be careful with what glue you use. I have spent quite a bit of time trying different things before finding some that work! The best I’ve found is unfortunately not super-available, it is canopy glue intended for RC model airplanes (I used “Formula 560 Canopy Glue”). 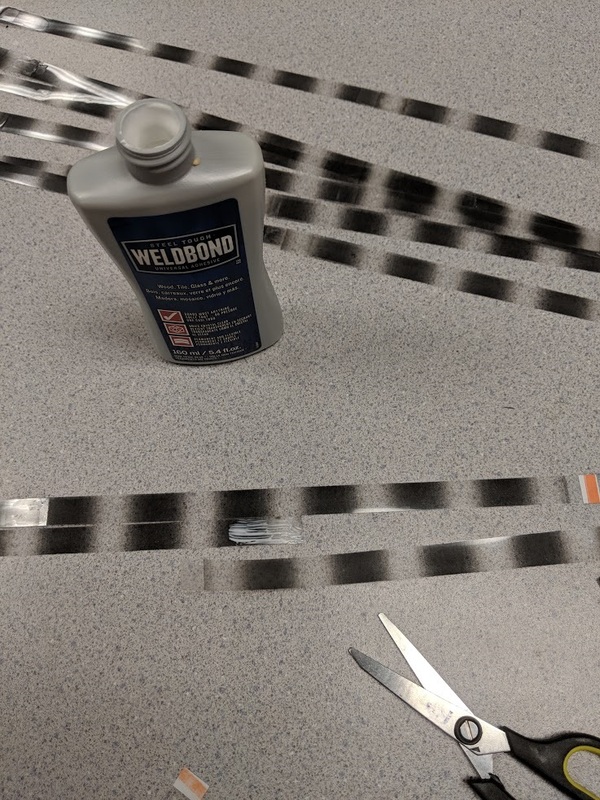 I am currently trying a less tricky to obtain glue (Weldbond) from my local hardware store, which many folks on the sites for those RC planes swear works for their purposes. I haven’t had enough time to see if this ages well, but it seems to hold for a while at least! Apply the glue with a small brush over a fairly large area of the strip (at least a couple of cm overlap taking care to align the waves properly. The glue will smudge the print, so try to glue the sides without ink! craft glue (‘Tacky glue’), epoxy… these all refused to adhere for me or broke when used. To get the waves straight and coherent I have tried aligning with rulers etc. 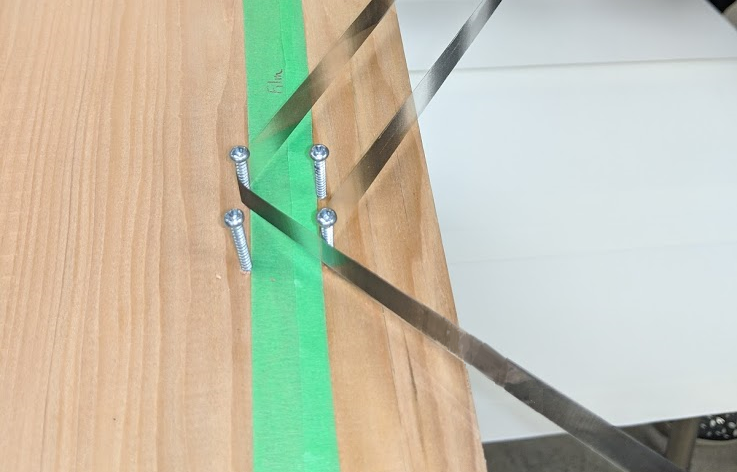 but it seems best to simply place another wave strip alongside the two you are gluing (as shown below), so you can position accurately by eye. The glue is loose for some time and minor adjustments can be made. Make sure you get the ends of both strips! It takes a couple of days for the glue to dry to a clear form, and it isn’t perfect, but it works! 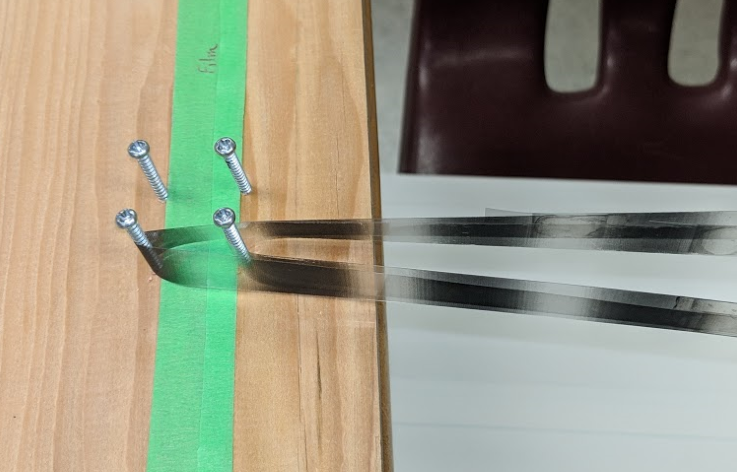 Long wave strips can be used to model interferometers or thin film interference by using pegs to “reflect” the wave (finishing nails in a board for example). Waves simply wrap around the peg and return, albeit with a very small shift in phase but this is generally negligible. A carefully chosen post or dowel, in fact, can even introduce a half wavelength phase shift on “reflection” (I have done this by wrapping paper strips and tape around a post to get the right thickness for the effect). Of course care must be taken to point out that this is not a good analogy for how actual reflection of waves occurs if one is trying to get clever this way! Thin film interference with thickness about ½ wavelength for this wave, giving constructive interference of the two reflections. A strip of coloured masking tape is used here to represent the film with reflection from front and back of the film. A follow-up article will show a resource using these models to investigate double slit interference. Many other activities are possible. I hope you find this wave model useful. The spreadsheet to generate the waves and some prepared PDFs can be downloaded here. Please let me know what amazing things you end up doing!